#SkiAcadia Update (3/12): Volunteer groomers were able to get out for a while on Tuesday morning and freshen up the Witch Hole Loop. The Classic track was holding good thanks to cool temperatures. Some bare spots may open up as the weather warms later in the week. Groomers predict the Aunt Betty Loop will remain snow covered through the weekend. 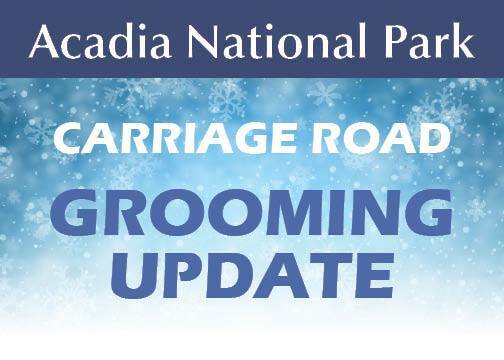 #SkiAcadia Update (3/11): After Sunday night’s rain, and with daytime temperatures expected to stay above freezing for the foreseeable future, grooming for the near term has come to an end. Because of the warm temps, conditions are currently soft and sticky. Thank you to all the groomers for your hard work this Winter! And who knows, maybe mother nature will surprise us with freezing temps and a Spring storm. #SkiAcadia Update (3/8): Eagle Lake Connector, Witch Hole Loop, Aunt Betty Loop, and Parkman Connector have been dragged. The snow is still soft but looks good. The classic track dragged yesterday is still holding up well so the volunteer groomers dragged to pack and widen the groomed sections. Groomers are planning to head out again tomorrow. Make the most of this weekend before the sloppy wintry mix comes in on Sunday! #SkiAcadia Update (3/6): Volunteer groomers are out this morning cleaning up the trails. Eagle Lake Connector and Hadlock, Paradise Hill, and Witch Hole Loops are packed and tracked. Amphitheater Loop and Parkman Connector are expected to be re-groomed later today. Stay tuned for more updates and enjoy! #SkiAcadia Update (3/5): With a foot of snow on Monday, and temps now below freezing, volunteer groomers began work early this morning. Eagle Lake Connector and Aunt Betty, Hadlock Pond, Paradise Hill, and Witch Hole Pond Loops are packed with some tracked. Amphitheater Loop and Parkman Connector are expected to be groomed later today. Stay tuned for more updates and enjoy! #SkiAcadia Update (3/4): Acadia National Park has received almost a foot of snow already today with a few more inches expected before the end of the day. AWTA volunteer groomers are planning to go out first thing in the morning tomorrow(Tuesday)—after the snow stops and park staff are able to plow out parking lots. Please check back here then for an update. #SkiAcadia Update (2/26) After last Sunday’s torrential rains, followed by bitter cold, park trails and carriage roads are nearly solid ice. Grooming has been suspended until additional snowfall and conditions improve. #SkiAcadia Update (2/22) On Thursday, the park received a couple inches of new snow on top of a crusty base. Most routes have been dragged since the snowfall although conditions have precluded setting a classic track. #SkiAcadia Update (2/19) Volunteer groomers cleaned up the Hadlock Loop today. The snow is too hard to set classic tracks, but is nice for skate skiing. Amphitheater, Aunt Betty Pond, Hadlock, Paradise Hill, and Witch Hole Pond Loops were packed on Monday, along with Eagle Lake and Parkman Connectors. The snow is thin, frozen granular with ice underneath and there are also ice floes in some sections of carriage road. Be careful and enjoy! #SkiAcadia Update (2/18): Volunteer groomers cleaned up the trails Sunday night and Monday morning for some nice President’s Day winter fun. Aunt Betty Pond, Paradise Hill, and Witch Hole Pond Loops have all been packed along with Eagle Lake Connector. Parkman Connector and Hadlock Pond loop have been partially groomed, but the snow is thin with ice underneath—enjoy! #SkiAcadia 2/14/19: Volunteer groomers packed the Eagle Lake Connector and Aunt Betty, Hadlock, Paradise Hill, and Witch Hole Pond loops last night and this morning. Eagle Lake Connector, Paradise Hill, and Witch Hole Pond loops have also been tracked. The snow is deep, but there is a solid layer of ice underneath it. Enjoy the skiing! #SkiAcadia 2/12/13/19: Volunteer groomers will likely venture out to groom this evening after they shovel out. We luckily missed the freezing rain and have a short window to ski before the next warm weather rain event. Stay tuned for updates and in the meantime, go break some trail! #SkiAcadia Update 2/1/19: Hadlock Loop and Amphitheater loop were groomed again yesterday afternoon, volunteer groomers packed corduroy but did not set tracks. #SkiAcadia Update 2/1/19: Grooming crews have smoothed out the surfaces on the Aunt Betty Pond Loop, Witch Hole Pond Loop, Paradise Hill Loop and the Eagle Lake Connector. Insufficient snow to set classic track but corduroy surface suitable for both classic and skate skiing. #SkiAcadia Update 1/31/19: After about 4 inches of overnight snow, groomers packed and set corduroy on Witch Hole Pond Loop and the Eagle Lake Connector. #SkiAcadia Update 1/24/19: Heavy rains, temps near 50, and high winds are wreaking havoc on the trails. Conditions will be assessed once the storm passes. Forecast snow mid next week may permit some grooming providing rain hasn’t washed away all the base. #SkiAcadia Update 1/22/19: Witch Hole Pond Loop, Paradise Hill Loop, Aunt Betty Loop and Eagle Lake Connector are all packed and dragged. The Brown Mountain Crew is out packing Amphitheater Loop and Hadlock Loop at the time of this post. The conditions are good and fast for skiing, with a few ice chunks here and there because of the original icy crust. Groomers will be out Tuesday morning to set more corduroy. Enjoy! For more information about cross-country skiing in Acadia and to see a map of the groomed roads, visit our AWTA webpage.